Photography is big business. From traditional, big-budget magazine shoots to the recent explosion of digital photography that has created infuencer millionaires on Instagram, there’s money to be made in creating unique, provocative photographs. But in a saturated, competitive marketplace – from real estate listings to travel photography to architecture projects – how can you stand out? Whether you’re looking to expand your existing photography business or begin a brand new venture, there’s a new technology that is disrupting how we see and experience the world – and how you can make money. 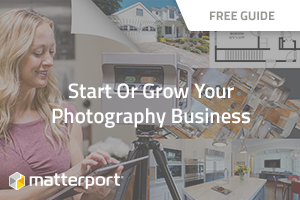 Read our ebook to learn how you can start or grow your photography business and beat your competition.